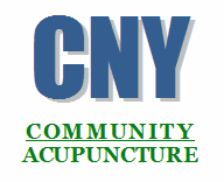 CNY Community Acupuncture provides high quality acupuncture treatments at affordable rates in a supportive community setting. We charge a sliding scale of $20 - $40. You decide what you can afford to pay because only you know what fits within your budget. We will never ask you for income verification. And, you may change what you pay at any time, moving up or down the sliding scale. We ask that you pay at the time of your visit, and have your payment ready when you check in. We accept only cash and checks. If you are unable to pay for a service at the time of that service, a $10 fee will be charged, payable at your next appointment. If you would like a receipt, we will gladly give you one. The receipts we use are called superbills and they have all of the information necessary for you to submit to your insurance company or FSA for reimbursement. Many patients who submit to insurance or for FSA prefer to not send multiple individual bills but to wait until they have had several treatments appearing on one invoice. We will do whatever works best for you. Just let us know what you would like when you check in. Our returned check fee is based on what the bank charges us (usually around $35). If a check is returned for any reason you will be expected to pay the bank fee and also honor the amount that was originally written on the check. We require 24 hours notice, in advance of an appointment, to cancel or reschedule that appointment. All appointments that are missed without a call are deemed a “No Show/No Call” and will incur a $10 fee, payable at your next appointment. We understand that same day cancellations are sometimes unavoidable, however, on and after the second same-day cancellation there will be a $10 fee charged for a cancellation/reschedule with less than 24 hours notice. The fee will be payable at your next appointment. If you arrive late for your scheduled appointment, please be aware that you may be asked to reschedule or wait for the next available appointment that day. Because appointment slots, in most cases, are only 10 minutes, if you are even five minutes late we may not be able to honor your appointment time if it poses an inconvenience to others. It is best to always plan on arriving 10 minutes early to your appointment so that you have time to check in, pay and gather your items to get comfortable in your chair. If you have any questions about any of our clinic policies, please call or email us and we'll be happy to discuss them with you!